Convergence is a bi-annual national/interneational conference for weavers, dye-ers, spinners, textile artists. I was selected as a Student Assistant to participate at this gathering of people who love making anything fiber related. It was held in Long Beach, California July 17 – 21. My motivation for going was to participate in two workshops, led by people who’s work I had encountered while working on my thesis. 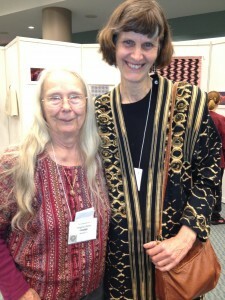 Kay Faulkner is a woven shibori artist and one of her specialties is warp woven shibori. The samples she brought with her were fantastic and a reminder of the endless possibilities of patterning. 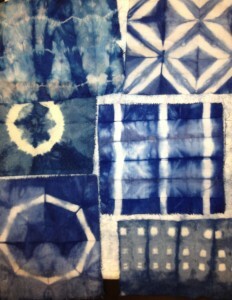 Thus far, my shibori work has all been weft shibori where I put the pattern threads in on the weft. Kay’s approach is to put the pattern threads in on the warp – which means fewer knots to tie. I also used fishing line for the pattern thread and attempted to tie secure knots with fishing line to create clear patterns. It was an excellent workshop in round robbin format allowing everyone to try many patterning techniques. Can’t wait to try this out at home. 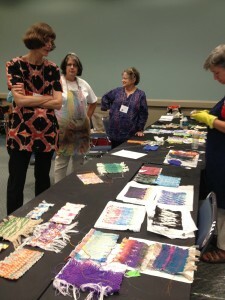 The second workshop was “A Greener Indigo” with Barbara Shapiro. Barbara was a delight to work with and walked me through the entire indigo vat process as we prepared for the next day’s workshop. The samples shown above were on six different fibers: spun silk, silk noil, rayon, cotton, wool and linen. The results were really intriguing and the dyes clear. I really like the idea of using “kinder” chemicals for dyeing and plan to experiment with indigo and other types of vat dyes. This last photo is a bit of hero worship :). I had the opportunity to meet people that I had read about and admired for their techniques and/or design aesthetic. Virginia Davis was specifically mentioned in my thesis for her innovative use of the ikat technique and the ability to convey beauty in simplicity. I had the opportunity to talk to her in person and learn more about her process. I have struggled to simplify my work while translating imagery and inspiration into woven art. The work of these textile artists has informed my own work. Thanks to Virginia, Kay and Barbara for making my Convergence 2012 experience so rich. And thank you to the Handweaver’s Guild of America (HGA) Fiber Trust members for making this trip a possibility.